The project begins on March 31, 2019 at Whitstable Biennale, Kent on Leysdown Beach, Isle of Sheppey. First There is a Mountain is a nation-wide participatory project to be choreographed Summertime 2019. The project involves the creation of a set of ‘buckets and spades’ in the form of world mountains, from which the public will be invited to build mountains of sand across the UK coastline and play out the world’s natural geography against a series of tidal times. Each pail is a scale model of five of Earth’s mountains. The artwork will tour twenty-five high profile coastal art venues around the UK, who will each stage a sand pail building event on their local beach. The ways in which the public interacts with the artwork at each location is integral to the evolution of the project and its overall experience. Participants will sculpt beaches into thousands of mountains of sand to form micro-geologies; serving as a poetic vehicle that connects diverse world mountains. A digital anthology will coincide with the project, where 20 writers have been selected to conceive new texts based on a beach location. 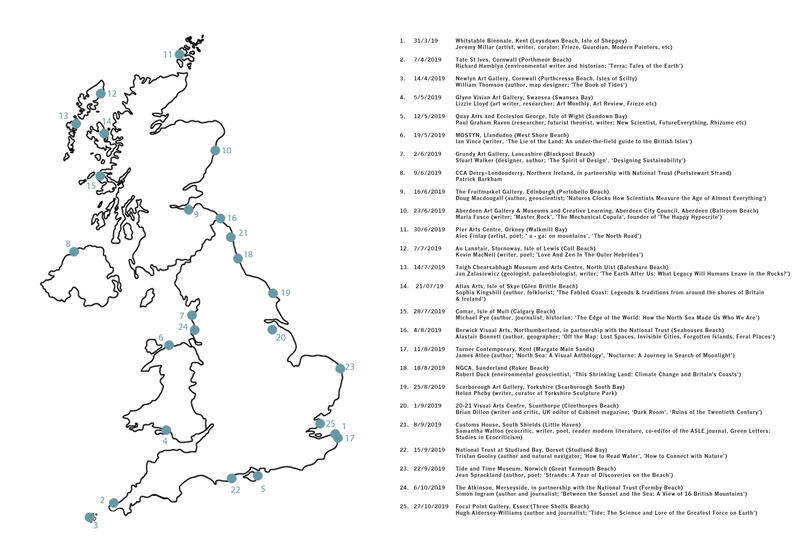 To view a map of where and when the project will take place, please click the link below. All are warmly welcome to attend. The project is supported by National Lottery through ACE and Creative Scotland.